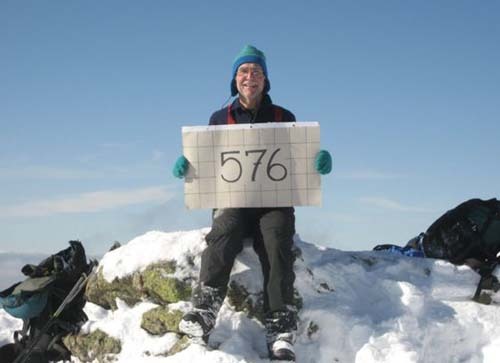 Guy finished The Grid on Mount Lincoln on November 10, 2007. He was accompanied by three other Grid Members. Left to right: Joe Comuzzi, Guy Jubinville, Ed Hawkins, and Cath Goodwin. The following article by Edith Tucker appeared in the Coos County Democrat. TWIN MOUNTAIN - The seventh hiker to qualify for the unofficial 576 Club lives in a log cabin home in Twin Mountain and works as the fulltime custodian-groundskeeper for the Appalachian Mountain Club's Highland Center at the top of Crawford Notch in Bretton Woods. Guy Jubinville, who is a member of two area search-and-rescue organizations - Androscoggin Valley (AVSAR) and Pemigewasset Valley (PVSAR) - completed his 12x48 on Mount Lincoln on Saturday, Nov. 10. 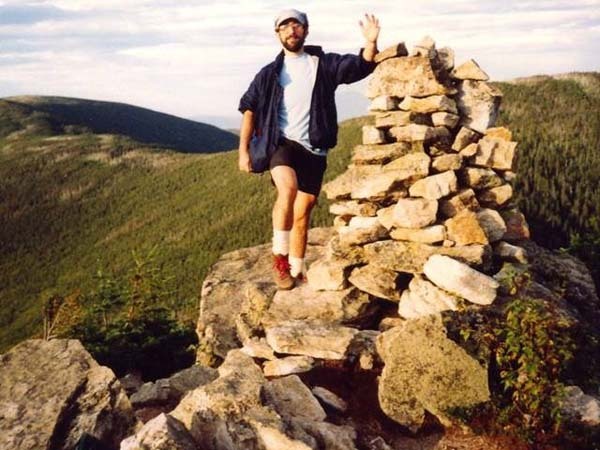 He is only the seventh recorded person to have hiked all the 4,000-foot peaks in the White Mountains in each of the 12 months of the year - an extraordinary feat that took 13 years for Mr. Jubinville to complete. Although there is an official AMC-recognized Four Thousand Footer Club, with a patch and certificate, that was formed 50 years ago in 1957 and two or three other official "clubs" - New England's "Four Thousand Footer Club" and New England's "One Hundred Highest" - the 576 Club is a very low-key group of elite hikers and joining represents a lifetime achievement, according to area peak-bagger Susan Schibanoff, who was active in PVSAR until recently. "The hardest months are November and April because of the transitional conditions, " Ms. Schibanoff explained. 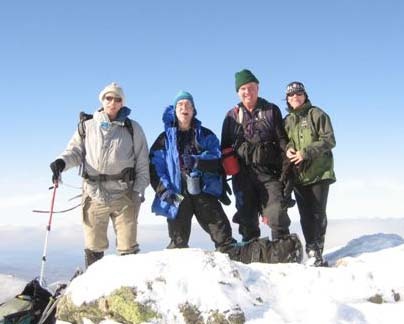 Hikers aiming for membership in the 576 Club set up a chart on which they write the names of the 48 White Mountains 4,000-footers on one axis and the 12 months on the other, setting up a "grid" on which to keep track of their achievements. "Basically, filling-in 'the grid' on quarter-inch graph paper gave me a long-term goal, kept me hiking, and in good shape," explained Mr. Jubinville, noting that he has now switched to keeping track of his peak-bagging on Excel software. "It's just a fun thing to do," the wiry outdoorsman explained. "The mountains, the trails, the ridges, and the views are beautiful." Other hikers have developed more arcane goals, such as spending the night on each of the White Mountain 4,000-Footers so they can claim a midnight stay. Yet others specialize in trail running. The 55-year-old New Hampshire native, who was born in 1952 and grew up and lived in Goffstown, Mr. Jubinville did not take up hiking until 1989 and then moved to Twin's Harmony Hill in 1994 after the company for which he worked in Merrimack experienced a job contraction. Since he was recently divorced, Mr. Jubinville recalled that he decided this would be a good time to take the leap and move North of the Notches. He landed a job as a CNC machinist at Burndy in Littleton. Mr. Jubinville said he had helped open the AMC Highland Center in 2003, which is a job that puts him in the heart of the mountains he loves and enjoys. He noted that he has also enjoyed the camaraderie of hiking with others who enjoy the challenge of getting out every month of the year. He said, "Along with some other hiking, I plan to do the grid again." Guy works for the Appalachian Mountain Club. The article below submitted by Maeve Lugris was in the AMC Insider (staff newsletter). The wind blows, the snow falls and Guy Jubinville keeps on hiking. Some of you might recognize the name, from his extensive involvement with Search and Rescue efforts, and some probably recognize his face from his ongoing service at the Highland Center. Well, now it's time we all recognize his awesome accomplishments as an amazing hiker and as a true steward of the outdoors. Guy works at the Highland Center making sure everything looks great and runs smoothly. He's always buzzing around with an energy that can't be matched. If there is a question that needs an answer, he's your man. He works hard, and he plays even harder. Peak Bagging has grown more and more popular over the years. Hiking all the 4000 footers in New Hampshire just isn't enough for some. (See the full list with elevations at http://www.outdoors.org/recreation/tripplanner/plan/4kfooter-guide.cfm). The newest twist is to hike each of the forty-eight 4000 footers in every month of the year. To even think about trying this takes an experienced body and an adventurous soul. Think about Mt. Washington in December, Mt. Madison in April, or bushwhacking to a summit in mud season. Just thinking about hiking Washington 12 times is pretty amazing! This is known to die-hard Peak Baggers as "The Grid". This concept was first introduced to Guy by a hiking partner, and when he heard about it, he knew he had to try. On November 10, 2007 Guy completed "The Grid" high atop Mt. Lincoln in the snow. That means he climbed each peak 12 times, which is 576 different summit climbs. Guy has shared some of his experiences with us over lunch, and it is truly amazing. He has been diligently planning and executing his journey over the last 13 years, and has realized his goal. He is only the 7th person to complete The Grid! His determination and discipline is admired and appreciated by all. From all of us at the Highland Center (& AMC) - Congratulations, Guy! 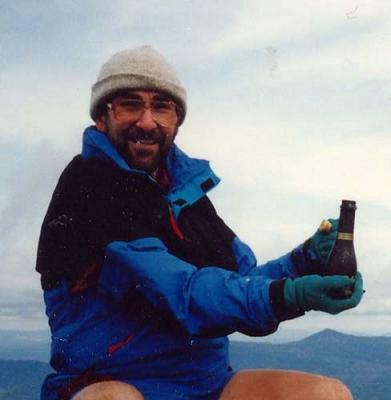 Here are some of Guy's hiking accomplishments and milestones. 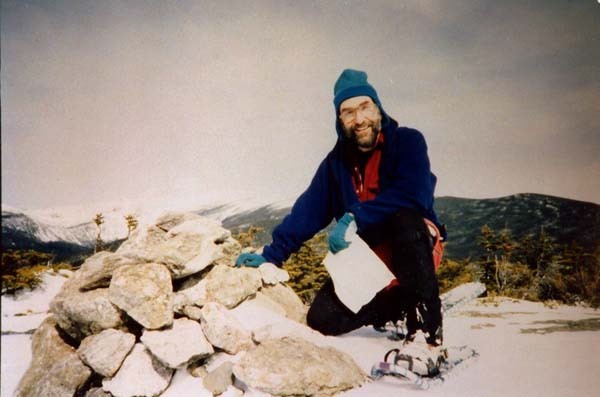 Guy began charting the GRID in 1994 with intentions of completing Mt Washington in every month which was accomplished on December 20, 1996.